Baking a good loaf of bread, much less a baguette is a challenge at which I’ve failed more than I have succeeded. It is a science, an art and an instinct (I think) that has to be cultivated patiently with hours of practice. 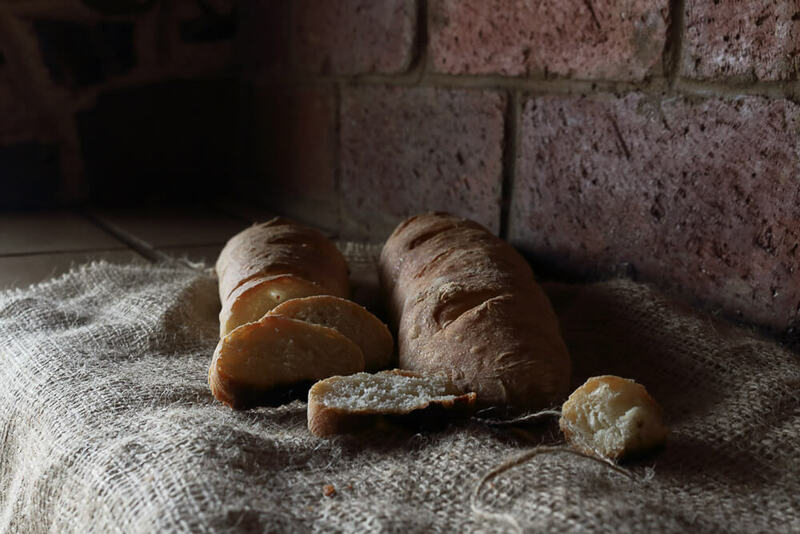 It is actually just simple chemistry between flour and yeast but the weather, the quality and consistency of the flour (which varies across brands and countries), the temperature temperaments of ovens and even the altitude of the place decide the character of bread. For me, baking bread is a bit like solving a cryptic crossword. I lick my chops at the thought of filling those blank boxes when I open the morning paper and on a good day, you’ll catch me walking around with a smug smile stuck on my face. With bread my experience is similar. The challenge and anticipation of watching the dough rise, listening for that hollow knock, and beholding that mounded crust crowning a loaf fill me with a sense of achievement like very few other things do. At that moment, all is forgiven – the iffy yeast, the reluctant rises, the dense blocks of brick bread….everything. But there have also been days when I’ve talked myself out of trying a recipe or technique dreading disappointment and the consequent wastage of a whole lot of flour. Many of us have let the fear of failure get to us, ignoring that urge to get our hands dirty at one more shot at bread. But to the dejected, I tell you, there is a recipe that will restore your faith in bread. A 4-hour baguette that will fill your home with warm hugs, comfort and nurturing. 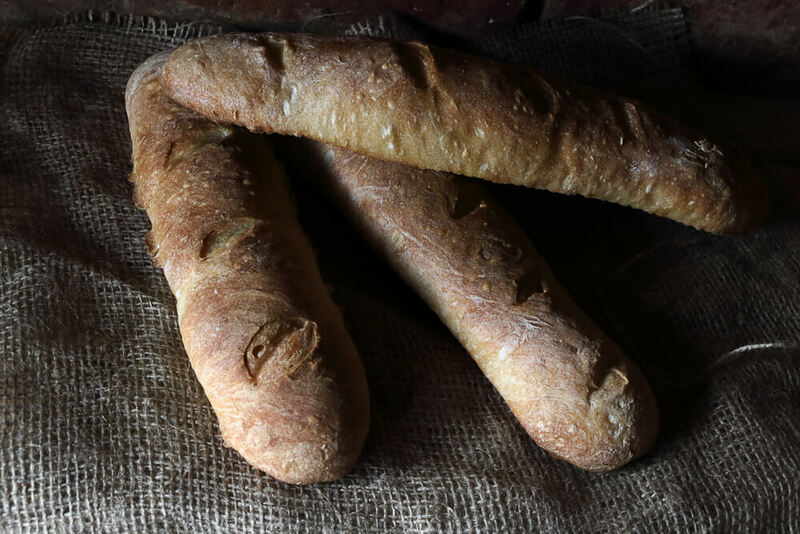 A Dan Leader (of the famed Bread Alone bakery) original, this baguette was featured in Saveur magazine’s award-winning, 2012 story American Bread by William Alexander. Pedigree aside, this, slightly tweaked version by Kristen Migelore of Food 52, is one of the most reliable I’ve baked with, in my personal journey of bread. 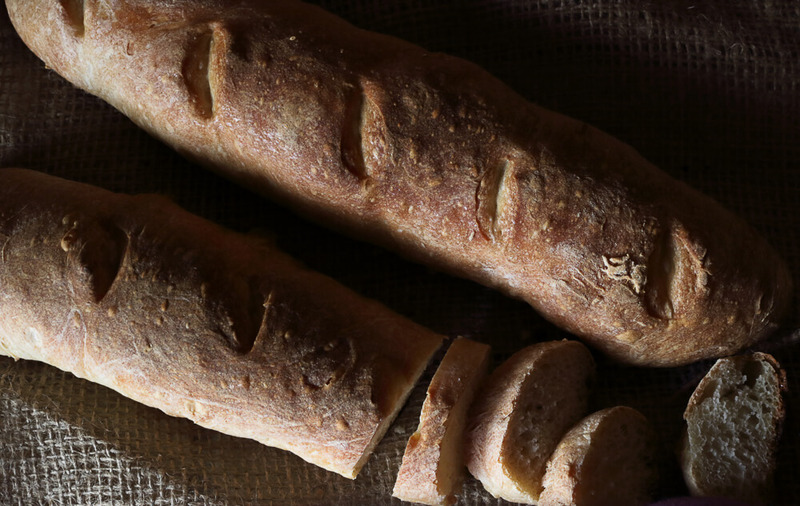 This baguette is beautiful in its simplicity – in terms of technique, equipment and ingredients. I would go as far as to say that it’s possibly fool-proof. Respect the process, follow it more or less to the letter and you’ll have 3 crusty, golden loaves with soft cottony craters inside begging for a smear of pate and a glass of wine (if you can hold off till you uncork that bottle). 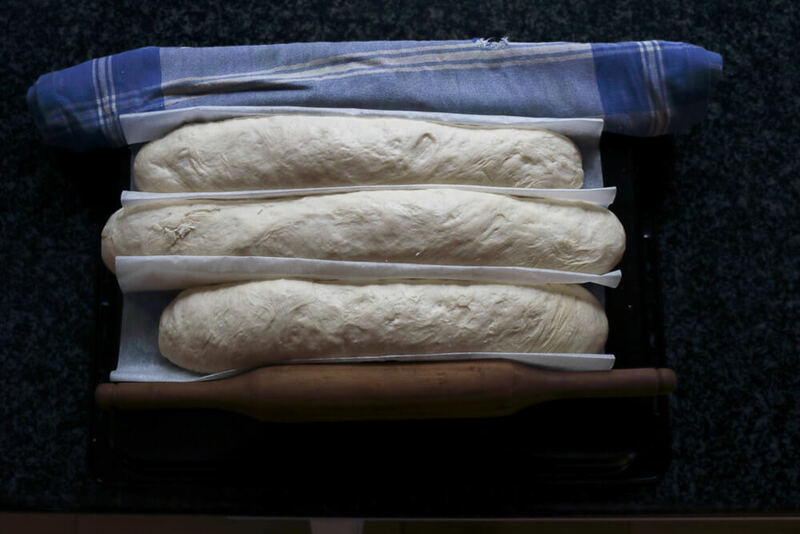 I started these baguettes early and gave them attention in bursts, interspersed with a workout, checking my emails and lots of little chores. I was sceptical of the 4-hour claim but it took me not a minute more than that to get these done (that’s some pretty precise recipe-writing skills there). And my guess is that even if you proofed for 55 minutes instead of 45 because you were answering the door, those delicious brown batons would still turn out right. There’s not much that can go wrong, except if you’re yeast is not in the mood (and that has happened to all of us at some time or the other). So, approach these baguettes with enthusiasm and they will rise to the occasion. A 4-hour baguette that's crusty with pillowy insides. Whisk the yeast into the warm water in a large bowl, cover and set aside for 10 minutes for the yeast to get foamy. Using a fork, mix in all the flour (it will be quite sticky), cover the bowl with cling film and set aside for 20 minutes. This will help hydrate the flour and autolyse the mixture. Once the water has been absorbed into the flour, add the salt and transfer the mixture to a lightly floured surface. Lightly oil your hands and knead the still quite wet mixture for about 10 minutes. To knead, push the dough away from you using the heel of your palms, fold the dough over once and push again. 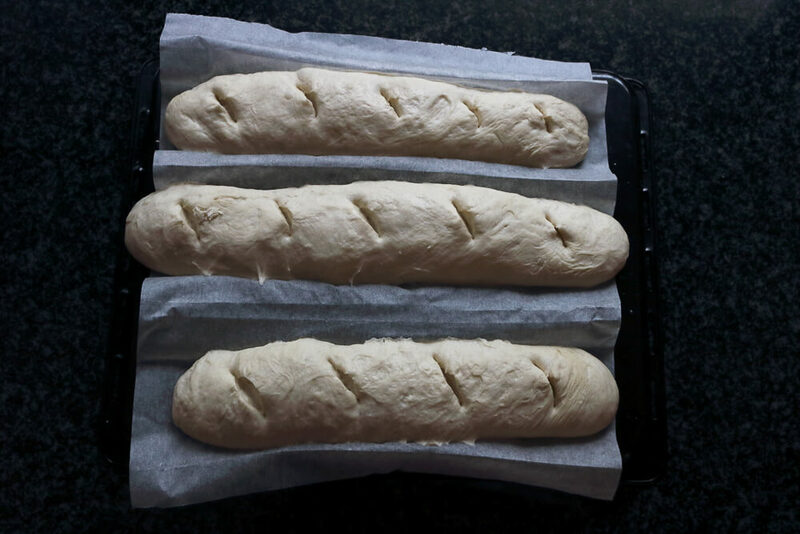 Repeat this action (using extra dry flour as needed but be careful not to use too much because a dry dough will yield a very dense loaf; the dough must be slightly sticky but handleable) till the dough forms a smooth ball. Transfer it to an oiled bowl, cover with cling film, place in a cold oven and allow to double in volume for about 45 minutes. Once the dough is nicely aerated and swollen, place it again on a lightly floured surface and using gentle pressure with your fingers, shape into a rectangle roughly measuring 8 inches x 6 inches. Then fold in the two 8-inch sides (like an envelope) first and then the two 6-inch sides. Put the dough back into the bowl (with the folded side facing down), cover with cling film and set aside in the oven to double for a further 1 hour. Transfer the risen dough to a lightly floured counter and cut into 3 equal portions. Using the flat palms of both your hands, gently roll each portion into 14-inch long tubes (similar to a sausage shape). Lightly dust a large enough sheet of baking parchment and place the tubes side by side on the sheet leaving enough gaps in between to create partitions by gently lifting the parchment (see picture). This helps to keep the tubes in place and allows them to rise upwards rather than sideways to get the shape of a baguette. Place a rolled tea towel or rolling pin to similarly secure both ends. Rest these for 50 minutes for the last rise. Meanwhile, place an iron skillet or thick steel pan at the bottom of the oven and set a rack to fit just above it. Place a baking stone or an upside down baking tray on the rack and preheat the oven to 245 degrees C. It will take at least 50 minutes for it to become super hot (although you can decide based on the size and heating of your oven). Once the dough has proofed, using a pair of sharp scissors, make 4, 4-inch long cuts at a 30-degree angle on the top of the baguettes. Carefully slide the parchment onto the upside down baking tray and drop the ice cubes into the iron/steel skillet at the bottom (the resulting steam helps form the crust). Bake the baguettes for 20 minutes till they are nutty brown and crisp on top.